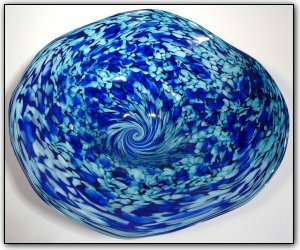 This wallbowl features many shades of aquamarine and blues, and nearly every shade in between, coming together in the center in a beautiful mesmerizing swirl. Make sure to zoom in to see just how deep and luscious the colors are, and the way they interact with each other. So amazing! This wallbowl can be hung on a wall just like an ordinary picture frame. To hang the bowl on a wall, all you need is a secure hook on the wall and a hanging apparatus comes along with the bowl. Hanging the bowl is a breeze and should take less than 10 minutes. You won't believe the compliments you are sure to receive when displaying this stunning wall bow!